Heroscape Tournament: Monsters & Magic! Mixing the sibling games together! As always, anybody is welcome to play with us, we are a relaxed bunch, always willing to help newcomers learn! 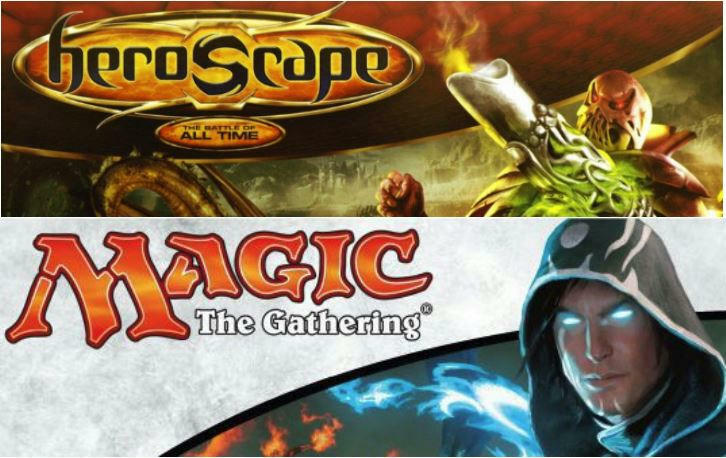 -Figures allowed: Official Heroscape (except Marvel) and official Arena of the Planeswalkers units. See spoiler for banned figures and other rules. *Max of 1 Planeswalker per army while you are army building, but keep in mind you are not required to have a Planeswalker in your army. Taking temporary or permanent control of an opponent’s Planeswalker is allowed as long as you don’t already have that same unit alive in your army. *The player with the most wins takes the cake, point differential will be used as secondary measure of winning, as necessary. Players will be pinned against each other in each round based on these scoring measures; the leader of the round fights whoever is in second, while third fights whoever is in fourth, etc. We will try to avoid rematches where possible. 1. AotP spell cards and creature summoning will NOT be used. Everything is going to be tweaked to follow Heroscape rules more closely. *Planeswalkers are considered 200 points less expensive than their card-listed cost. *ALL AotP figures will start the game in respective players’ start zones. *You may mix and match any color combinations of AotP units in your army. We are not enforcing any color alignment rules in army building. *You may use AotP squads/heroes without having a Planeswalker in your army. *Order Markers will be used for ALL turn management. Putting an order marker on a Planeswalker means that you must take that turn with the Planeswalker. AotP Planeswalker “flex-turns” to take a turn with a different squad/hero of choice will not be allowed here. 2. AotP unit abilities that reference spells/sorceries, deck/drawing/discarding, and summoning/unsummoning will not be allowed to activate in play. The units are not banned, though. 5. Heroscape and AotP abilities can “cross-activate” onto any eligible figures if the conditions for those abilities are met. *Example 1: If Arlinn, Moon-Blessed deals combat damage in a turn, the player may use her Howl ability to place a +1 attack counter on the Tarn Viking Warriors to increase the vikings’ attack. *Example 2: When Eldgrim the Viking Champion is destroyed, the player may use his Warrior’s Swiftness Spirit to place his figure on the Elf Rangers to increase their normal move. *In general, we are taking the rules and cards as literally as possible. *Zombies of Morindan are Undead Savages, and not “Zombies” for effects such as Liliana Vess’ Zombie Toughness, or Ghoul Vanguard’s Shambling Ranks of the Dead. *Gideon Jura’s Counter Strike will work against any adjacent attackers, including special attacks, since his card makes no distinction. *Red creatures/Planeswalkers are not lava resistant, even if they breathe fire. *Heroscape units are considered colorless for any AotP-borne abilities. AotP units have no general (Jandar, Utgar, etc.) for any Heroscape-borne abilities. Any rules questions, feel free to ask me ahead of time. Any rules conflicts during the tournament will be decided by me, and if I am unsure, the player with the highest D20 roll will decide for me. TBD. Looking to be a Saturday/Sunday afternoon/evening in late June. TBD, likely $2 per player. All collected money will be used as prizes - store credit/gift cards. Tournament winner gets 60% of pool, second place gets 40%. TBD. Planning to use maps that mix AotP terrain with Heroscape terrain. Each map is likely to feature 1-2 standard tournament power glyphs (Gerda, Wannok, Dagmar, Valda, etc.) Strongly considering putting the AotP turn-by-turn heal glyph on a map. Feel free to PM me or post in this thread with any questions or comments! I can also be contacted at BuffaloHeroscape@gmail.com. I also plan on taking pictures of games in progress as I get a chance, and I will definitely post battle report on Heroscapers, and likely on FB as well. Last edited by brandonwiker; April 16th, 2019 at 01:35 PM.